There's no doubt about it: in most parts of the United States, a car is a necessity. Where we live, in what some describe as a suburb of Flint, Michigan (we live 15 miles outside of Flint, so I'm not sure I would describe Fenton as that, but some do), there is no public transportation. We are just a couple of miles away from several large stores, such as Walmart, Target, Home Depot, and a locally owned grocery store. We are close to downtown where the library is located and other small shops and restaurants. We could most certainly walk to many of these destinations, and Jason has a bicycle that he uses often in the summer. But for the most part, especially with a baby, a car is necessary for us. Jason works about 10 miles from home, and our closest family is more than 20 miles away. We have designed our lives so that one car works for us, but one car doesn't work for many families. If you both work outside the home and also live in an area with no public transportation, two cars are probably going to be necessary. There's a lot to owning cars, and I'm not just talking about a car payment. In fact, a car payment may be the least of your worries. I was thinking about the cost of owning our car the other day, and once I was adding up all the costs for it, I was actually shocked. I had no idea our car cost so much! Beyond our car payment that we're paying each month, we spend money every month on gas and car insurance. So go ahead: add up those three things. Those three things for us adds up to about $477. A month. Now add in the rest of your costs. Oh yes, we're not quite done. Let's see: we get oil changes every three months for about $16 an oil change, our registration costs are about $130 a year, and of course, car repairs are a "when," not an "if." I would say, on average, we spend $50 a month on car repairs. Adding up those three things amounts to about $66 a month. Our car costs us $543 a month. For one car. I can't even begin to stomach the idea of another car. Owning a car is honestly serious business. Not having a car payment would seriously lower our monthly car expenses, and I'm super grateful that it looks like our car will be paid off in 2014 (and sooner rather than later to boot!). But even without a car payment, our car takes up a serious amount of our monthly income. The larger the car, the higher the expenses. Your registration costs will be higher, your gas costs will be higher and there could be more car repairs. For instance, our car has 4-wheel drive, so it has extra parts that could break and need to be repaired. The more parts a car has, the more parts that could break. Cars will break. Things will happen. Just in the last few months of 2013, we had to fix several things on our new-to-us car that we had purchased in August. Car repairs are definitely a when, not an if. If you don't have an emergency fund, you need one. You'll want to keep at least the cost of your deductible in it. Pay for your insurance for six months or a year at a go. This will likely get you a little bit of a discount, plus you'll save on administrative fees. Shop around for car insurance every year. You may not find anything, but it doesn't hurt to look and make sure you're getting the best rate. Be sure to compare apples to apples, though. Low quality car insurance may not really be worth saving a few bucks. Pay your registration on time. You'll have a little bit of fine if you don't. Our local branch is never super busy. I like to go in the middle of the week, first thing in the morning. If you can't swing that, go first thing on a Saturday. You'll be in and out in no time. Drive as few places as possible. This doesn't just mean walking or biking. It really means: stay home. Do you really need to go all the places you think you do? When you do drive, combine all your errands and determine the best route. When we do leave home, we are often gone for several hours because we'll go to the post office, the library, Target, CVS and church in one day. Sometimes this means we eat lunch out (that is budgeted with money from other areas of the budget), and sometimes we'll plan to go right after lunch or right after breakfast. Always use gasbuddy.com to find the lowest price on gas in your area. We are so in love with gasbuddy.com. There's an app for it, if you prefer to use apps. We generally know the cheapest gas station in our town, but the website becomes particularly useful if we are outside Fenton as we don't know gas prices well outside of our town. It's worth it to drive an extra mile or so to save a few pennies per gallon. Our tank has at least 17 gallons so if we're saving 3 cents, that quickly adds up. The other day, we saved more than 20 cents per gallon by using gasbuddy.com. We were pretty excited about that! In the winter, if you live in a cold climate, be sure to gas up often. We gas up every week no matter what. Your vehicle will get better gas mileage if the tank is more full. Speaking of gas mileage, be sure you are inflating your tires often. Low air in tires also affects your gas mileage. Be sure to track your miles per gallon - this will come in handy if you notice a sudden dip in your miles per gallon. It likely means something is wrong with your vehicle and you can circumvent the problem before it becomes a huge hassle. Call around for prices on oil changes. We did this when we first moved to Fenton, and our local Muffler Man has the cheapest oil change prices. We've been using them since we moved here, and I wouldn't go anywhere else. Their employees are also super honest, which we really appreciate. 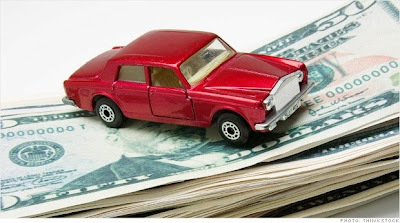 Pay off your car as quickly as possible, if you have a car payment. Then, start a car fund. Put whatever you can into it per month. The goal would be to have a car fund with enough money that you can buy your next car in cash. Know how to repair cars or learn how. We are so thankful for my father who knows cars and he teaches us how to repair our car as we go. Jason and I have both learned a lot of skills. Most car repairs, we do with my dad. There are some that are better to be done in a proper shop, but we can fix most things. This saves us a significant amount of money. If you are a two-car family, I would just really encourage you to consider if there's any way at all you can become a one-car family. It may be uncomfortable. It may not even seem doable. But it may be something worth trying. If you're interested in trying, don't feel the need to sell your second car just yet. Call your insurance provider and ask to put the extra car on parking insurance. That way, you can test out the one-car concept to see if this works for you and your family. If you can't become a one-car family, you'll want to utilize the tips above to make the best of the situation. Cars shouldn't take up more than 20% of your take-home monthly income, so add up the costs of owning your cars and see what your percentage is. Personally, I would prefer our car costs not to add up to more than 10% of our income. Once our car is paid off, we'll be much closer to that goal. Lastly, can I just encourage you to think outside the box? Talk with your friends and family. See what they do to save money on car ownership. Is there any way you can carpool to grocery shop? What about taking a walk once a week to complete an errand? Could you find bikes at garage sales and bike around to complete errands or visit friends? What about making it a point to stay home 4 or 5 days of the week except for traveling to and from work? Could your husband or wife complete errands for you on their way home from work? Owning a car can be expensive, but it's definitely doable. And since it's typically necessary to own a car, we just have to do the best we can with what we have. You can make this work!